Here in the UK, we have an organisation called the UK Youth Parliament (UKYP). They go to a lot of effort to make sure the youth of today have a say in the important decisions that affect their lives. Now, what does politics and the UKYP have to do with education and literacy, and why should this matter to young writers? Young budding writers have the ability to create change with their words. They can influence key decision makers in all areas of life. From writing a persuasive letter to your council to protect local wildlife, to writing a speech that could inspire people to donate at a charity event, the skill of persuasion is something every young writer should hone and cherish. Therefore, I ask every young writer to not ignore this fact and use their power over words to create change. Literacy plays an integral role in “a curriculum to prepare us for life” (the UKYP’s current campaign). After all, how can we expect young talented writers to reach their full potential without life skills in persuasion and influence? How can we expect to see a young writer get published without the ability to really pitch a manuscript to a publisher? A good grounding in the art of persuasive writing is key. The exact same skills used to persuade a publisher to take a look at your manuscript can be used to influence and interest people in issues that matter to you. So why not use the skills you need to flourish as a young writer to generate positive change within your community on a political level? Politics and literacy go hand in hand. Martin Luther King would have struggled to persuade the masses that his “dream” was desirable without his mastery of emotive language. Winston Churchill may have failed to inspire a country to “fight on the beaches” without his competency in the art of repetition. Ghandi probably would have allowed the whole world to be blind without his ingenious use of wordplay. Words have the ability to captivate and motivate a nation for decades. 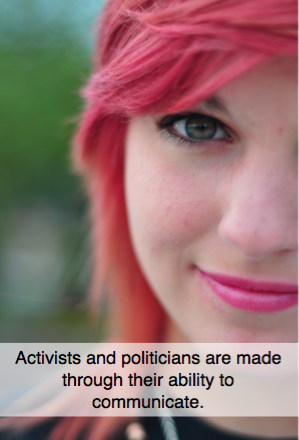 Activists and politicians are made through their ability to communicate. Change comes with a person’s ability to make an idea blossom through language. This is why politics needs skilled young writers and why skilled young writers need politics. A campaign without inspiring language is a campaign without heart or the ability to succeed. How can we expect to captivate decision makers without astounding alliteration or Personification? How can beautiful examples of language go down in history without campaigners utilising it to create tangible change? Young writers have a gift and it would be a shame to see that gift not used to influence government on issues that matter to young people. As such, I urge all young writers to get pen to paper and influence the powers above on something that matters to you. During the UKYP debate in the House of Commons, I witnessed marvellous example after example of Members of Youth Parliament wielding the tool of language to communicate their constituents’ opinions with their colleagues and the audience at home. I heard stories of young people’s struggles with bullying and passionate words preaching of the injustice that votes at 18 means for the informed 16 and 17 year olds of our nation. It’s an understatement to say that I was inspired by the words said in that iconic chamber. This is a perfect example of how those with a great capability of the English language have used it to their advantage. They illustrated the issues that matter to them and their peers, in the effort that this will create real social change. A society without young writers who aren’t fully able to express their feelings through words, is a society that is incapable of fully listening to the voice of the youth. Every young writer with an interest in politics is put in a fantastic position. You can use your gift of language to create real change locally, nationally or even internationally. Even if politics isn’t really your thing you can still use your emotive and persuasive writing to create change in your own life and the lives of those close to you.